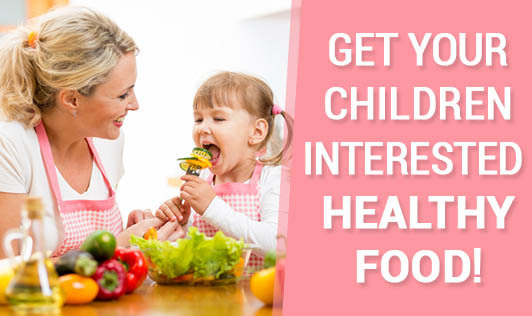 Get Your Children Interested In Healthy Food! With so many fast food chains and processed food options available, children hardly eat any healthy food. They get attracted to colourful, fatty, salty and sugary foods which are usually processed. This makes home food look boring and tasteless. Here are some tips to make home food interesting to make your child eat healthy and enjoy it because it is not just about what you cook, but how you cook too matters! • Instead of making a French toast by coating bread with egg, try cutting a hole in the middle of the bread and pour the egg in the hole. Wait till it is cooked and flip over. Add salt, pepper and herbs for taste. Watch your child enjoy it! • Replace your salads and steamed vegetables with a stir fried variety. Make sure you add plenty of vegetables with different colours and keep the vegetables crisp. Don't hesitate to add seasonings like soy sauce, vinegar, olive oil, lemon, salt, pepper, herbs etc. • Pasta! Kids will always love pasta. It is always better to make pasta at home than to buy from fast food chains. It is also very simple to make tomato based pasta with grated cheese on top. Now, which child wouldn't love this? • Just like pasta, make pizza at home too! You can make a thin crust wheat pizza base and add healthy and exotic vegetables like olives, mushrooms, red and yellow capsicum etc to make it colourful. • Does your child make a fuss to eat chapathi and dal/sabzi? Just make it into a roll! Though these ideas may seem time-consuming, you will see how your child responds to these ideas and develops healthy eating habits right from the start!